- Location! Walk to the beach, beach club pool, restaurants, lake and Seaside. DETAILS: What a perfect vacation getaway! 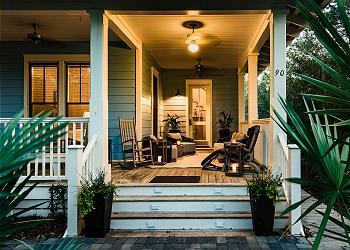 This fabulous well-maintained 3-story cottage has a beach charm all it's own. The living, dining, kitchen areas are on the second floor offering a beautiful, relaxing open floor plan with comfortable furnishings. The dining area seats 8 and accesses a porch with a swing and table for two at the front of the house. The fantastic kitchen has large windows that let in plenty of sunshine and provides stainless steel appliances, granite countertops and a bar that seats 4. The living area has a fireplace and accesses a large, very private screened in porch with outdoor dining area seating 10 people on the back of the house. Also located on the second floor is a full bathroom with a shower. This home has 3200+ square feet with spacious rooms and a private corner lot. Two families shared this beautiful home over New Years. The beds were comfortable and the kitchen well equipped for our Low Country Boil! As the weather wasn't great, it would be nice to have some other comfy chairs on the main floor as we were often crowded on the two couches and couldn't use the outdoor spaces as much. We enjoyed the bikes and loved exploring the beautiful area! We are so glad that you all enjoyed your vacation with us in Watercolor! We will be sure to share your feedback with our entire team. Thank you for staying with 360 Blue, we hope to see you again soon! Every year we plan a family vacation with our children, their spouses and our grandchildren. This year we decided to try Watercolor. The location was wonderful for us. We could walk to the beach easily, take a short golf cart ride to Seaside for the food trucks, shopping and a Concert. The property at 90 Silver Laurel Way was spacious and we loved all the porches and used the large table on the back porch for most meals at home and games. The main problem we had was using the stove. After contacting 360 Blue on Sunday, a technician came to help us out. Great responsive service. We would recommend this home to others. Thank you! We were a party of 10 and a baby. The house was perfect for us. Location was perfect and an easy walk to the beach, two pools, boat jouse and Seaside. Gorgeous view from the third floor master. We enjoyed coffee eacg morning on the large screened in porch. We look forward to staying here again! We are so glad that you and your family had a wonderful vacation with us! The photo you shared with us is breathtaking! We agree that this home is in a wonderful location and accommodates large groups perfectly! We hope to see you again very soon! This house was perfect! 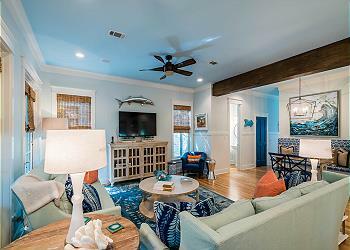 Gorgeous decor, spacious, comfortable & cozy with the beach/vacation feel and a great location to enjoy all of the Watercolor and Seaside spots. My family of 5 (kids 8, 6 and 3) plus my inlaws stayed and we had room for many more. We were beyond sad to leave. We are already planning our next visit and will most definitely be staying at 90 Silver Laurel Way again. THANK YOU! Sounds like a truly amazing family getaway! We are so thrilled that you enjoyed your stay and we look forward to seeing you back at the beach soon!